The CBD industry is booming: the market is predicted to hit $22 billion by 2020, outpacing the earnings from the medical marijuana industry. CBD has a slew of potential benefits, from pain relief to anxiety reduction to treating insomnia. It has almost as many options for consumption — CBD is available in tinctures, as topical lotions or as tasty treats. Medix’s CBD Gummies help take the edge off with fun gummy bears. Each one of these CBD gummies is infused with premium quality hemp oil. There’s less than 0.3% THC, so you won’t feel any psychoactive effects or ring the alarm on any drug tests. They’re carefully formulated to give you the best possible CBD experience, with 10 mg of CBD per gummy bear. 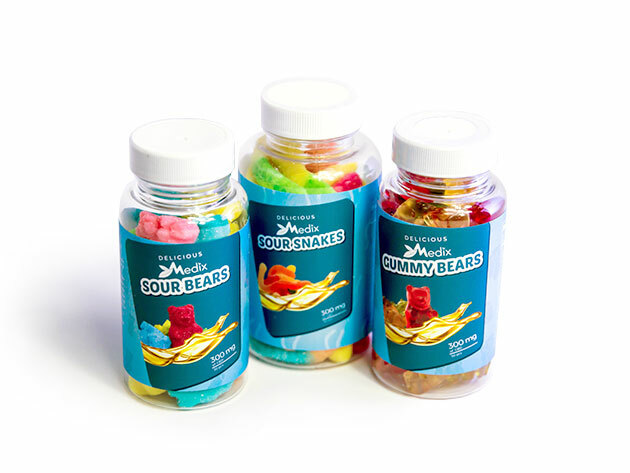 These gummies are available as regular or sour gummy bears, rainbow bites and sour snakes. They’re a great option for anyone who’s tossing and turning at night or looking for a way to take the edge off after stressful days at work or after night classes. Usually, it would cost $49.99 to see if Medix’s CBD gummies are right for you, but right now you can check out the benefits of CBD for only $35 (29% off).